Japanese director Naomi Kawase has had such an unusual career so far. She has been celebrated by the Cannes Film Festival right from the beginning, being awarded the Camera d'or (best first film award) in 1997 for Suzaku. Ten years later she won the Grand Jury Prize (the runner-up prize) for The Mourning Forest. Yet none of her films have met any kind of commercial success and even in Japan she is considered a bit of an outcast, as she lives away from Tokyo and does not belong to the industry. And she is back this year, with the very frank admission that she is here solely to win the Palme d'Or, with Still The Water that she describes as her masterpiece, having prompted some uncharitable comments on social medias as a result (although I suspect some of her comments got lost in translation). Still The Water is a coming of age film but while this sub-genre usually involves some self-absorbed young characters, here the story also involves spirituality, and is filled with some mystical undertones. Set in the tropical island of Anami, we follow a young Japanese girl, Kyoko (Jun Yoshinaga) as she falls in love with the laconic Kaito (Nijiro Murakami). But their budding romance is disturbed by several dramatic events: Kyoko's mother is terminally ill, and they discover a body washed up on the beach that is connected to her. The film feature some of the most quietly devastating and yet strangely peaceful scenes of agony and subsequent deaths, the first one with a goat (which is repeated later on) and the second one with an elderly woman. Some of ramifications are linked to a specifically Japanese way of seeing the world, but it is not out of reach for the rest of us. 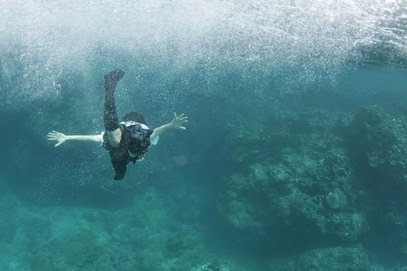 What Naomi Kawase describes is the cycle of life and death within nature, and for our intellectual superiorities and achievements, we are no different from the animals that surround us: we are all going to die one day, and whereas it can be seen as sad or whether we embrace make no difference to its ineluctability. What is old must die for what is new to be born. While the theme of man and its communion with nature is one that the Japanese director has already evoked, she has upped her game from an visual point of view compared to her previous films, with some breathtaking shots of ocean waves, of nature at times in its might and fury, at other times in its tranquility. Magical, lyrical and profoundly engaging, filled with romantic images in the true meaning of the word, Naomi Kawase is at peace with nature and her own cinema, not being afraid to let it flow freely while conjuring some of the most beautiful and moving imagery we are likely to see in Cannes this year. Her cinema is not for everybody and while juries work in mysterious ways, I would be surprised if there was not a prize for her comes this week-end, even if the Palme d'Or will probably elude her yet again. Still The Water. Japan. Official Selection.